Ranbir Kapoor took some time off his busy shooting schedule and flew off to New York over the weekend where he rang in the New Year with his family and guess who joined the actor for his trip to the Big Apple? If your answer is Alia Bhatt, you're right. Alia Bhatt and Ranbir Kapoor, who have been making headlines for their rumoured relationship for quite some time now, celebrated the New Year's eve together. Neetu Kapoor, who is in New York with her actor-husband Rishi Kapoor undergoing medical treatment for an undisclosed disease, shared photos from their family dinner on Instagram. 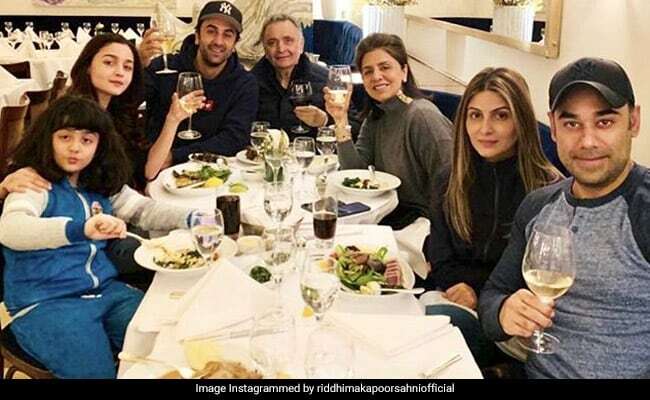 The photo shared by Neetu Kapoor features herself with Rishi Kapoor, Ranbir, Alia, Riddhima and her husband Bharat Sahni and their daughter Samara. "Happy 2019. No resolutions only wishes this year !!! Less pollution traffic!! Hope in future cancer is only a zodiac sign! 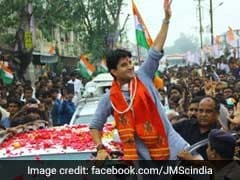 No hatred less poverty loads of love togetherness happiness and most important good health," Neetu Kapoor captioned the photo. Riddhima Kapoor Sahni, who arrived with her family in New York over the Christmas weekend, has been filling up her Instagram timeline with photos and videos from the get-together last night. Rima Jain and Nitasha Nanda also featured on some of the photos shared by Riddhima. The photos shared by Riddhima are proof that the family had a gala time. In September, Rishi Kapoor tweeted that he was leaving for the US for medical treatment and requested everyone "not to unnecessarily speculate." It was speculated that Mr Kapoor had been diagnosed with cancer, but the reports were dismissed strongly by elder brother Randhir Kapoor. Soon after Rishi Kapoor accompanied by his wife Neetu and son Ranbir left for the US, Alia Bhatt flew to NYC to visit them. Ranbir and Alia, who often trend for their rumoured romance, made headlines once again after their pictures of them shopping together in New York hit the internet. Fan clubs curated photos of the rumoured couple, where they can be seen holding shopping bags and posing. #RanbirKapoor and @aliaabhatt spotted on the street of NYC. Alia, who has always been a self-confessed fan of Ranbir Kapoor, appeared to confirm that she's dating the 36-year-old actor in the debut episode of Koffee With Karan 6. Ranbir and Alia, who have collaborated for the first time in Ayan Mukerji's Brahmastra, are often spotted hanging out together. Not just this, Alia also shares a wonderful rapport with Ranbir's mother Neetu Kapoor as well as sister Riddhima. Instagram exchanges among Alia Bhatt, Neetu Kapoor and Riddhima happen quite often. Alia and Ranbir have often given us not-so-subtle hints which made us speculate their relationship status. Though Alia Bhatt and Ranbir Kapoor have not made their relationship official, the actress' filmmaker father Mahesh Bhatt spilled the beans on her much-speculated relationship status in an interview to Telegraph in November, which is enough to put all rumours to rest. "Well, of course they're in love. You don't need to be a genius to get that!" Now, if that's not a confirmation that Alia and Ranbir are seeing each other then we don't know what is," the 70-year-old filmmaker said.